The it bag of the summer season is wicker bags. In 2018 the humble beach bag has brought their high-fashion big sister to the summer party and so we have a collection of fashionable straw bags in 2018. Wicker bags perfectly embody the feeling of summer, freedom and lazy days on the beach which is why it blossomed into such a popular trend. For such a strong style these wicker bags actually come in lots of different shapes, materials and colors; the most popular being the round straw shoulder-bag. 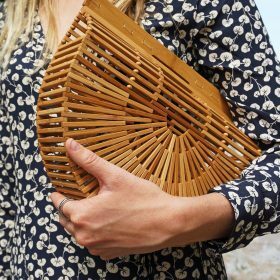 Other popular materials for wicker bags are bamboo and rattan - which of these will you pick for your it bag of 2018.